NAE is proud to announce our first annual Nevada Employers Conference! This full-day event will bring together state and federal regulators (Department of Labor, Nevada Equal Rights Commission, Office of the Labor Commissioner, Equal Employment Opportunity Commission, etc. ), industry experts, and legal professionals to discuss the latest developments in labor and employment in Nevada and nationwide. Are you curious what the Trump era will mean for HR professionals and businesses in Nevada? Do you want the opportunity to pick the brain of industry experts and legal professionals regarding your most pressing HR dilemmas? Want the opportunity to test your HR knowledge in a fun game of Employment Law Jeopardy? Don’t miss the opportunity to attend what is slated to be an exciting and informative event. Register today! The agenda for the 2017 Nevada Employers Conference can be found HERE. Agenda subject to change. Contact training@nevadaemployers.org regarding this event. 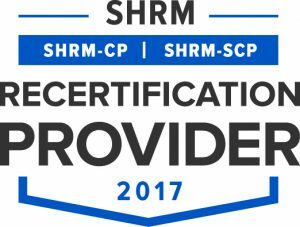 This program is approved for 6 HR (General) recertification credit hours toward aPHR™, PHR®, PHRca®, SPHR®, GPHR®, PHRi™ and SPHRi™ recertification through HRCI.